These days, it can be quite scary storing important data in the cloud. We were sold a bill of goods that the cloud was safe and secure, but with so many data breaches, it’s only a matter of time before your data is exposed. Sad but true. If you want to store important files locally, a drive with hardware encryption is ideal. Keypad variants are quite convenient, as they can easily work on all operating systems, such as macOS, Windows, and Linux distros. Today, DataLocker Inc. announces a beautiful such drive with a unique feature -- an OLED screen. Is an OLED screen gimmicky? Maybe a bit, but it’s cool nonetheless. The drive is not all flash (pun intended) and no substance, however. 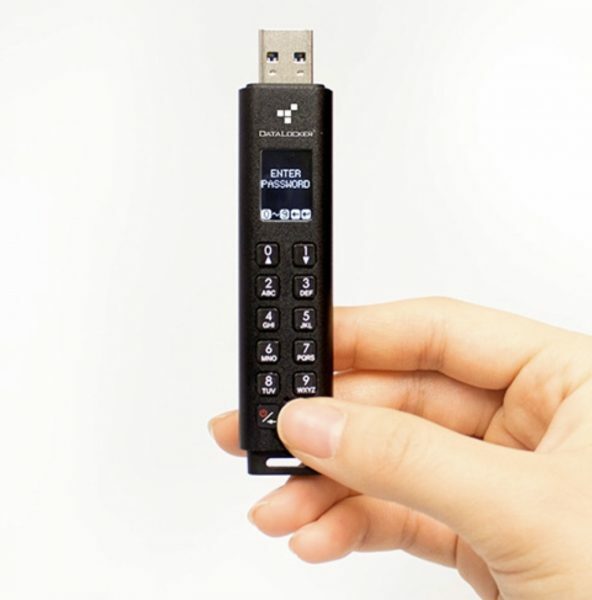 It uses 256-bit AES hardware encryption to secure your files. And yes, it is FIPS 197 and IP57 certified. "The Sentry K300 is the industry’s only platform-independent and OS agnostic keypad flash drive which incorporates an OLED display and represents the next generation of encrypted data storage products. In addition to the display’s true alpha-numeric password-based authentication, the Sentry K300 offers users a full featured, visual based menu driven system to easily change passwords, set password policy and enable other security features without needing to consult a user manual. The Sentry K300 utilizes micro SSD flash memory to offer unparalleled speed and performance," says DataLocker, Inc. The company further says, "The Sentry K300 requires no software or special drivers, and easily works with Windows, Linux, Mac, Android phones and tablets, Chromebooks, and embedded systems that can use USB mass storage. The K300 has its own power supply and can be used as a bootable device running Windows to Go, Ubuntu Linux, or local operating systems. The Sentry K300 offers User and Admin roles, read only mode, an Admin configurable password policy, an auto-lock feature, and rapid secure wipe in case the drive is lost or stolen." DataLocker Inc. shares the following features of the drive. The Sentry K300 is available immediately in several capacities, ranging from 8GB ($136.99) all the way up to 256GB ($368.99). Regardless of storage size, they all come with a three-year warranty.